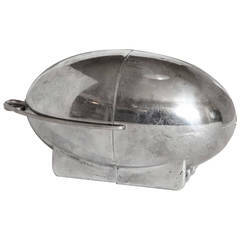 Art Deco Machine Age Industrial Design Thermette Hot Lunch Box by Privett Mfg. Art Deco Machine Age Raymond Patten iconic patented Skyscraper Hotpoint toaster Another of the early classic American Industrial Modernist re-designs by Patten. Design Patent USD86804S, 1931, for the Edison General Electric Appliance Company. Skyscraper chromed-metal and Bakelite design. Unique tipping toast mechanism, activated by lever on base. 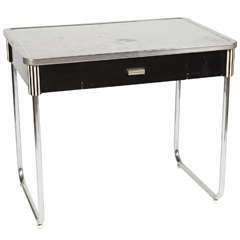 Stylized Gazelle Art Deco case. Featured in several Modernist Museum collections. Very good original vintage condition, Untested. Difficult to source in any condition. Toasters all started somewhere, and this is only one of the many early designs. Made to put a piece of toast / bread on each side to toast. Model 115t17 . Machine age glass rolling pin with screw on metal end cap.